Eschewing demonization, Coulter nevertheless demonizes. Consider alone her books, Godless and Demonic, which clearly demonize the Left in spiritual terms. NOTE: A comprehensive critique of Demonic can be found in The Beauty of Conservatism at www.coulterwatch.com/beauty.pdf. Ann Coulter, Guilty: Liberal “Victims” and Their Assault on America, Crown Forum, 2009, pg. 244. Ann Coulter, Slander: Liberal Lies About the American Right, Crown Forum, 2002, pg. 1. Ann Coulter, Treason: Liberal Treachery from the Cold War to the War on Terror, Crown Forum, 2003, pg. 292. Ann Coulter, Godless: The Church of Liberalism, Crown Forum, 2006, pg. 1. Ann Coulter, Demonic: How the Liberal Mob is Endangering America, Crown Forum, 2011, pg. 4. 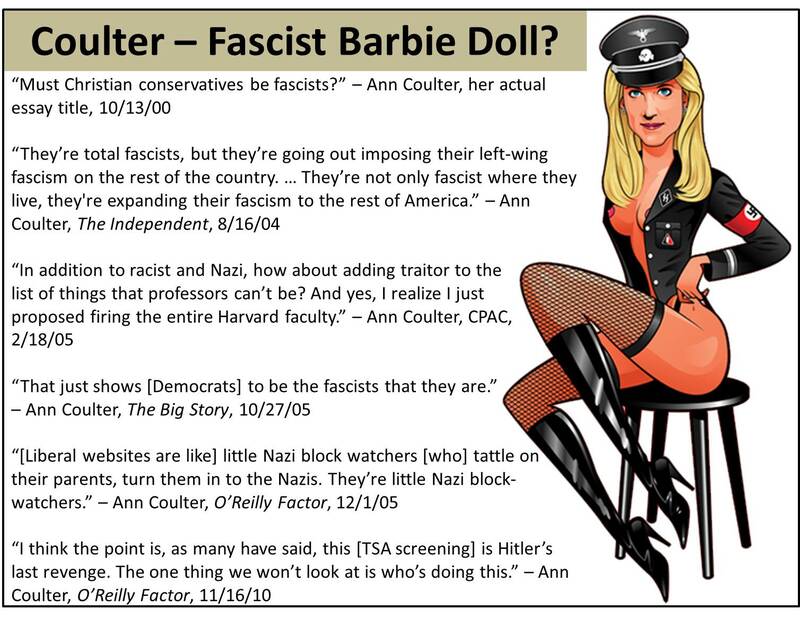 “Ann Coulter’s Demonic,” 8/1/11, http://theroadupward.wordpress.com/2011/08/01/ann-coulters-demonic/. If conservatives don’t demonize opponents, then Ann Coulter is not a conservative. 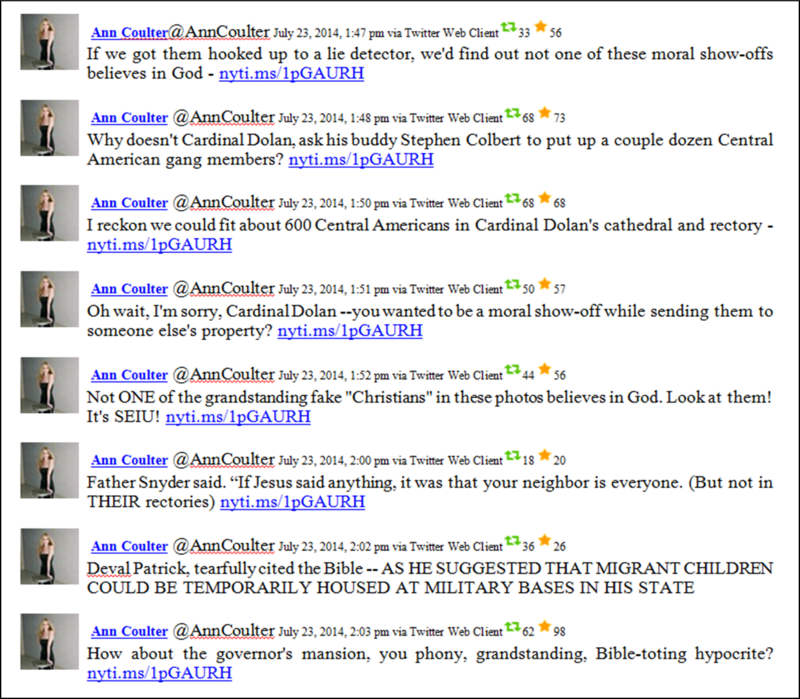 Having lambasted those who employ Nazi imagery, what does Coulter do? Employ Nazi imagery. Coulter’s remarks at the Heritage Foundation come as no surprise to those who have witnessed Coulter’s regular use of Nazi imagery. “Ann Coulter: The blonde assassin,” The Independent, 8/16/04. Ann Coulter, The Big Story, FNC, 10/27/05. Ann Coulter, O’Reilly Factor, FNC, 12/1/05. Ann Coulter, Glenn Beck Show, 10/5/07. On Wednesday, Coulter went on a half-hour Twitter rant upon reading a New York Times story about the chaos on our southern border. Her condemnation was a mixture of hatred for immigrants, hatred of liberals, and hatred of liberal Christians (who, in her mind, not only aren’t Christians at all, but don’t even believe in God). Above all, it was an arrogant expression of self-righteous indignation. Before continuing, it would be worth reading her complete set of tweets on the subject. Notice Coulter’s intense hatred of people – church leaders and parishioners alike – whose theology compels them to adopt political positions with which she disagrees. Because Coulter does not agree with them, they must be lying hypocrites. She claims none of them believe in God! Coulter seems incapable of recognizing faith in action. She abhors the intended results and presumes evil motivations. Because she regards them as “fake ‘Christians,’” then something other than biblical doctrine must be motivating them, such as personal aggrandizement. 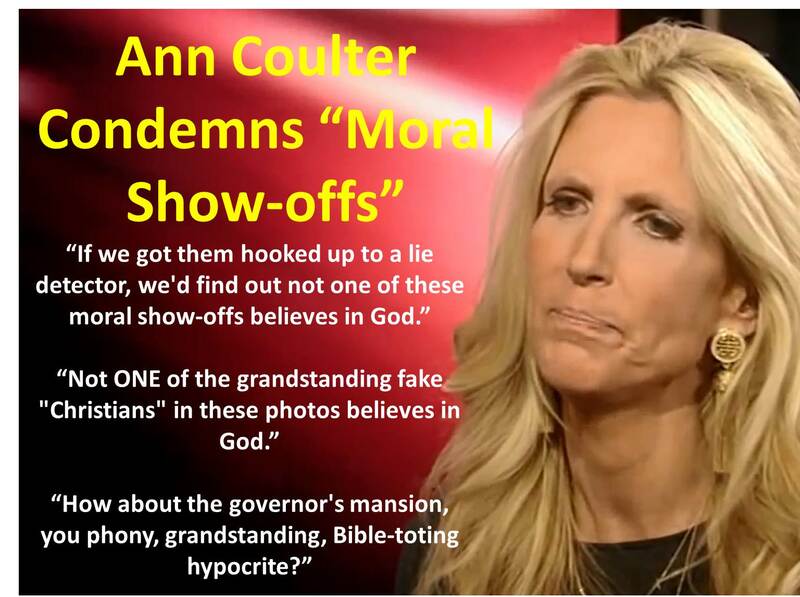 These “moral show-offs,” in her mind, are “phony, grandstanding, Bible-toting hypocrite(s).” Consequently, Coulter impugns not only their motives but their character. Pretty tough words for people Coulter has never even met! But as we have seen, Coulter is incapable of controlling her own “strong human impulse to be self-righteous and censorious.” All of her “moral fervor and censoriousness” “comes bubbling up” – and it’s all directed at liberals! Coulter, devoid of charitable impulses, cannot grasp simple Christian charity. She is right that the government should not be involved in dispensing compassion. But she attacks individuals, charities, and churches for doing what they are called to do. See “Ann Coulter Auditions for U.N. Ambassador” at http://t.co/R7IDzwnUJ8. Is Coulter a Moral Show-off? Treason (2003) – All liberals are traitors. Godless (2006) – All liberals are godless. Demonic (2011) – All liberals are demonic. The Beauty of Conservatism at www.coulterwatch.com/beauty.pdf. 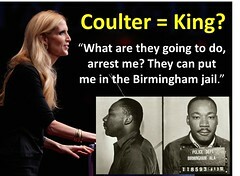 The Gospel According to Ann Coulter at www.coulterwatch.com/gospel.pdf. Vanity: Ann Coulter’s Quest for Glory at www.coulterwatch.com/vanity.pdf. Never Trust Ann Coulter – at ANY Age at www.coulterwatch.com/never.pdf. Ann Coulter has again trashed principled conservatives to extol a corrupt establishment Republican who used fraudulent and illegal methods to retain power. In the midst of crises, character is forged and proven, and true leaders emerge triumphant. In the midst of the darkness of deceit and treachery, the light of truth shines most brightly. Coulter eschews the light as she runs to the darkness. Coulter began her column by listing a series of current domestic crises, then asked, “why is a dime’s worth of money being wasted on trying to replace the Republican senator from Mississippi with a slightly different Republican?” Because principles matter! Slightly different Republicans? They are drastically different Republicans. One is a pro-establishment incumbent who engaged in a smear campaign and voter fraud, then covered it up. The other is an anti-establishment Tea Party candidate standing up for principles and the rule of law. But for Coulter, the rule of law does not matter as long as her candidate wins. The majority of Coulter’s column focuses on race, Cochran’s racial bona fides, and the Left’s dark history of racial animus toward blacks. But she blames McDaniel – not Cochran – for injecting race into the campaign. At the onset of her racial attack against McDaniel, Coulter admitted, “Yes, it’s annoying to see a Republican appeal to Democratic voters to save his seat.” Coulter utterly ignores Cochran’s illegal and immoral methods of effecting that appeal. Say again, “alleged Republican activists?” Disputing “votes from blacks?” But that isn’t what McDaniel alleges! McDaniel is focusing on illegal votes, not black votes. It is Coulter who is obsessed with color. 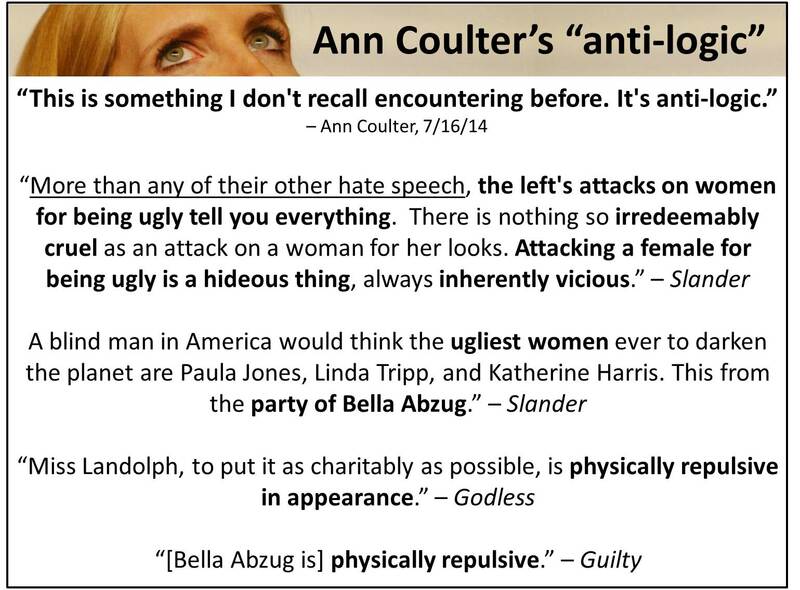 Color matters to Coulter. Again attacking McDaniel, Coulter lied, ‘But it’s really fantastic to have McDaniel supporters out there denouncing Cochran for getting blacks to vote for him.” McDaniel is addressing a corrupt campaign which used fraudulent means to win a primary election. These are the real questions: Why is Coulter so adamant that McDaniel ignore his opponent’s voter fraud and why is Coulter so determined to have a GOP nominee who wins the primary based on the will of the Democratic base and not the Republican grassroots? Answer: If the election were honestly run, the anti-establishment Tea Party candidate would beat the establishment incumbent Republican. For Coulter, it’s all about results, not principles. But if you’re principled, you’ll get the result. ESSAY 1: “Coulter Attacks Principled Conservatives” at http://t.co/npUIoRm4gt. What does Ann Coulter have against genuine conservatives? Coulter attacks what she is not. Standing up for principles – and for principled conservatives – seems to be very difficult for Coulter. Indeed, taking Coulter’s “pragmatic” approach has proven counterproductive for several election cycles. ESSAY 2: “Coulter is Just Wrong About McDaniel” at http://t.co/zc4kKlqV25. Coulter is wrong – legally and politically – about McDaniel because she supports the establishment candidate over him. Coulter has been an establishment RINO for many, many years. In the last election cycle, she attacked every Republican who threatened the candidacy of her political savior, Mitt Romney. Indeed, she still regards his as an exemplary candidate who should run for president in 2016. As a consequence of her factually-challenged polemics, the reputations of good people have been tarnished and the conservative brand has been damaged. ESSAY 3: “Ann Coulter, Orwell’s Protégé” at http://t.co/QYVkBapTIO. Coulter was recently called a “Manchurian Columnist,” conjuring up images of propaganda and brainwashing. Certainly, Coulter is the consummate propagandist and her recent polemic against Republican Senate candidate Chris McDaniel is representative of her work. Coulter utilizes many Orwellian techniques to fool her readers into believing her big lies. Among them, Newspeak, doublethink, the memory hole, and character assassination. Coulter also uses humor and ridicule to delegitimize her foes, and uses exaggeration to effect. 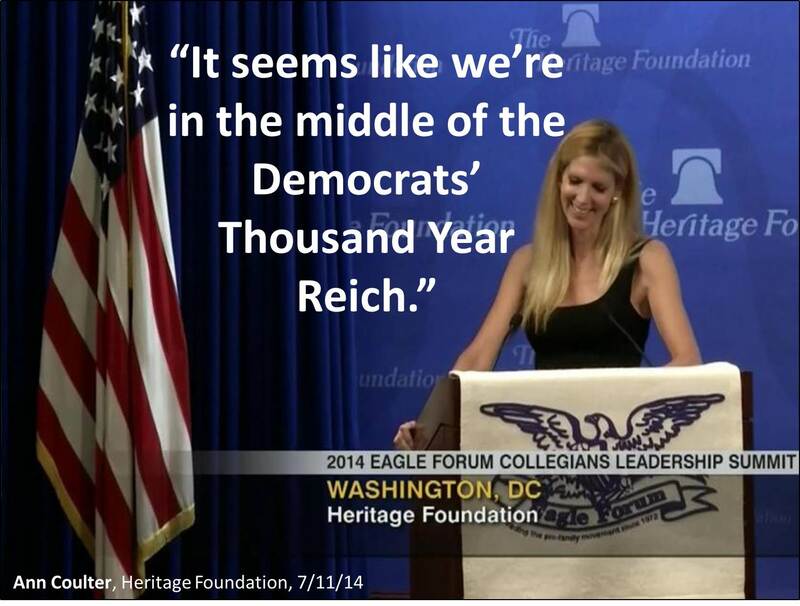 Ann Coulter, “Eyes on the Prize,” 7/23/14. This has been true for most of the past two decades and, most recently, in her disparagement of soccer as “foreign.” See “Coulter’s Soccer Flop – Part Trois” at http://t.co/uy7FDPu79v. See also Chapter 4: “Prejudice,” in Vanity: Ann Coulter’s Quest for Glory, 2012, available as a free download at www.coulterwatch.com/vanity.pdf. See “Case Study # 7: Mitt Romney – Ideal Candidate,” Vanity: Ann Coulter’s Quest for Glory, 2012, available as a free download at www.coulterwatch.com/vanity.pdf. This from the stereotypical Ugly American who recently, again, became an international sensation, this time for her repeated denunciations of soccer as un-American, succinctly encapsulated in two words: “It’s foreign.” Coulter’s antipathy toward foreigners and immigrants (legal and illegal) is legendary. Perhaps she is auditioning for an ambassadorship to the United Nations. Wouldn’t that be a hoot! Surprisingly, Coulter, a world-traveler, “spent summers in Spain” as a child and, as an adult, traveled worldwide to Grateful Dead concerts and ski resorts. In fact, her first soccer diatribe was published while she was in Paris (France, not Texas). Let’s consider Ann Hart Coulter for the next U.S. Ambassador to the United Nations. Wouldn’t that be a sight to behold? Coulter favors Western Europeans (those who are non-liberal, non-feminized, and non-pacified) over the rest of the world, particularly the Third World. But English must be spoken! 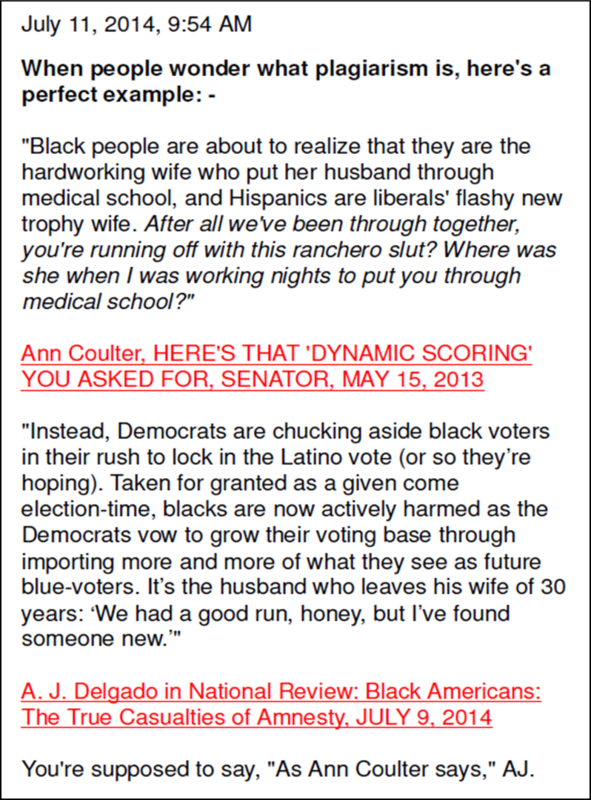 Here is a sampling of classic Coulter commentary. Travel the world through Ann’s eyes. Although she is opposed to the totalitarian regime in China, Coulter nevertheless ridiculed blind Chinese dissident Chen Guangcheng, tweeting, “Couldn’t we just tell that blind Chinese dissident that he’s in America now?” Responding to the controversy she had created, Coulter joked, “I’d say they’re being a little myopic, except they’d be offended.” One could say that Coulter is blind to her own insensitivity. See Chapter 10: “Equality: Self-Evident Truths,” The Gospel According to Ann Coulter, 2012, available as a free pdf download at www.coulterwatch.com/gospel.pdf. It documents Coulter’s astonishing predilection to racism, sexism, and classism. 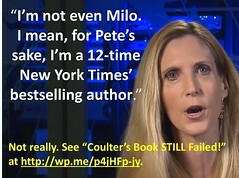 “Coulter’s Soccer Flop” at http://t.co/myPlCIUFpU. 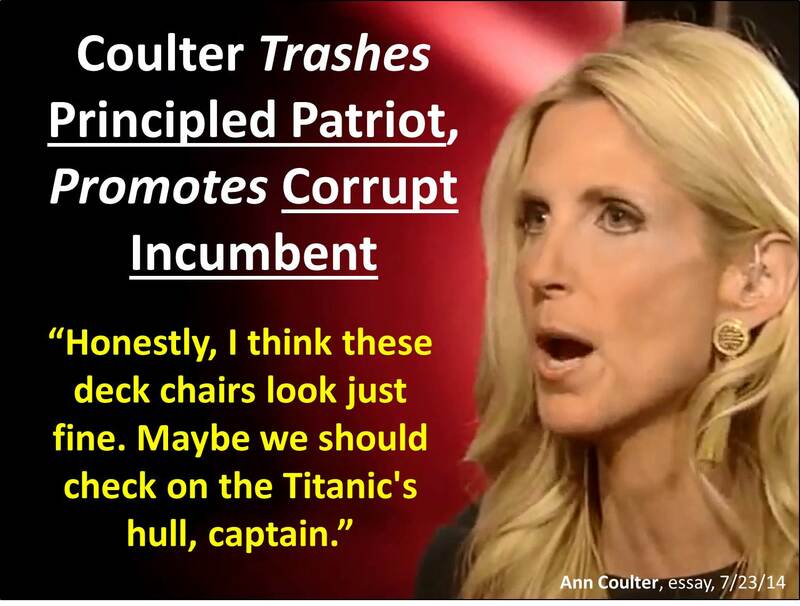 “Coulter’s Soccer Flop – Part Deux” at http://t.co/QJbINYv0JF. “Coulter’s Soccer Flop – Part Trois” at http://t.co/uy7FDPu79v. Ann Coulter, Hannity & Colmes, FNC, 11/30/04. Ann Coulter, Hannity & Colmes, FNC, 3/13/06. “Ann Coulter Mocks Chinese Activist’s Blindness,” New York Observer, 5/4/12, http://observer.com/2012/05/ann-coulter-mocks-chinese-activists-blindness/. “Ann Coulter Responds To Furor Over Her Blind Man Joke By Making More Blind Man Jokes,” New York Observer, 5/4/12, http://observer.com/2012/05/ann-coulter-responds-to-furor-over-her-blind-man-joke-by-making-more-blind-man-jokes/. Ann Coulter, Foglio, October 2004. Ann Coulter, “Attack France!” 12/20/01. Ann Coulter, interview, GOPUSA, 6/10/02, https://www.gopusa.com/interviews/coulter_061002.shtml. Ann Coulter, Sean Hannity Show, ABC Radio Network, 7/21/06, http://mediamatters.org/items/200607240011. Ann Coulter, Cashin’ In, FNC, 9/15/07. Ann Coulter, “Liberals: Born to Run,” 7/19/06. Ann Coulter, New York Observer, 1/10/05. Ann Coulter, “Muslim Bites Dog,” 2/15/06. Let’s be logical. Coulter employs anti-logic all the time. Is it logical to condemn attacks on women’s looks – calling it “irredeemably cruel,” a “hideous thing,” and “inherently vicious” – while doing so yourself? Frequently. As occasion permits? Is it logical to condemn attacks on the intelligence of people – calling it childish – while doing so yourself? Frequently. As occasion permits? In Slander (2002), Coulter wrote, “This is how six-year-olds argue: They call everything ‘stupid.’” But, also in Slander, Coulter asserted, “If a conservative says you’re stupid, you’re stupid.” And, in that very same book, she proceeded to identify all those she regards as stupid. Here again, Coulter is wrong. Both sides do do it. Coulter does it. In a stunning entry on her website, Ann Coulter falsely accused a journalist of plagiarism. On July 11th, Coulter wrote, “When people wonder what plagiarism is, here’s a perfect example:” Her example (contained in the graphic below) certainly isn’t “perfect.” In fact, it isn’t plagiarism at all. Where does this nonsense come from? Perhaps from far too many years defaming innocent people and getting away with it. No one ever holds Coulter accountable for her lies! Remarkably, while she falsely accused another journalist of plagiarism, Coulter herself has plagiarized on at least two occasions: in High Crimes and Misdemeanors (1998) and Godless (2006). Coulter very first book, High Crimes and Misdemeanors, contained the words and work of her co-worker, Michael Chapman, whom she later claimed she had never even heard of. Coulter later privately admitted that she should have given Chapman credit, but she has never done so publicly. The paperback version omitted Chapman entirely. This reality should embarrass conservatives. Do honesty and integrity no longer matter? As with her first book, the publishers of Godless, of her Human Events’ column, and of her syndicated column all defended Coulter. The golden goose had to be defended at all costs.